Humidifying your guitar is an important part of maintaining your instrument. So to protect your precious instrument from damage, you’re going to want to find the best guitar humidifier for your situation. Check out the recommendations below to see which will work best for you! Why Do I Need To Humidify My Guitar? Which Guitars Are Most Susceptible to Humidity? 86 out of 100. Incorporating 800+ ratings and reviews. To the uninitiated humidifying your guitar can be a challenging idea to wrap your head around, but in practice it can be as simple as sticking a sponge in your guitar case and letting natural processes take care of the rest. Case in point: D’Addario’s Planet Waves Acoustic Guitar Humidifier. 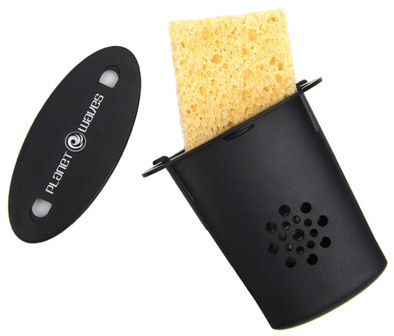 The D’Addario Planet Waves Acoustic Guitar Humidifier works by suspending a sponge inside of a plastic, non-drip casing. As water evaporates from the sponge, it raises the ambient humidity inside of your guitar case. The wood then absorbs the excess humidity, keeping your instrument from drying out. While the D’Addario Planet Waves Acoustic Guitar Humidifier is affordable, you do have to take care when using it. Always be sure to squeeze the sponge to removes excess water before placing it into your guitar, and also be sure to use distilled water with the sponge. Using distilled water helps to prevent mold growth, which means that your sponge will last longer. 91 out of 100. Incorporating 200+ ratings and reviews. The MusicNomad MN300 Humitar Acoustic Guitar Humidifier works exactly like the Planet Waves humidifier above. Simply wet the sponge, squeeze out excess water, replace the sponge into its plastic housing, slide the housing through the strings, and you’re good to go. However, there is a small quality-of-life feature that helps to increase the product’s ease of use. 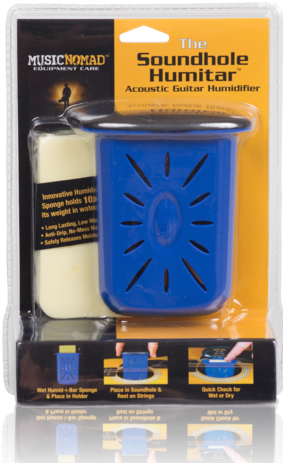 The top of the MusicNomad MN300 Humitar Acoustic Guitar Humidifier’s plastic casing pops open easily, allowing you to check the condition of the sponge while it’s still resting in the strings of your instrument. This allows you to quickly check whether or not the sponge in your humidifier needs to be rehydrated, which is going to be a huge help if you have several different instruments. The MN300 also uses sponges with anti-dripping properties which, while not a huge feature, does help to prevent the possibility of water leaking from your humidifier into your guitar. 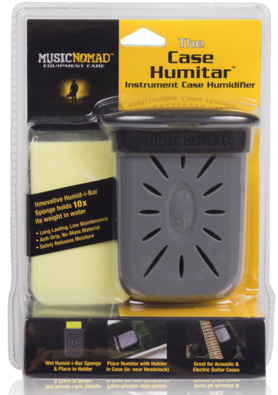 The MusicNomad MN303 The Humitar Instrument Case Humidifier functions similarly to the humidifiers above, though there is a key difference between this product and those above. The MN303, rather than being suspended by your guitar’s strings, sits in the case. The cool thing about a humidifier that sits in the case is that it can be used with essentially any stringed instrument. It’s a great option if you have a “non-standard” acoustic guitar, like a classical, archtop, or gypsy jazz guitar. You can also move the humidifier to the cases of other string instruments, which is a huge asset if you’re a multi-instrumentalist. Like the MusicNomad humidifier above, checking the sponge of the MN303 is a snap. Simply pop open the top and touch the sponge, if it’s soft leave it and if it’s hard change it out. As always, be sure to use distilled water with your humidifier. 86 out of 100. Incorporating 175+ ratings and reviews. The Oasis OH-6 Case Humidifier is a bit different than the humidifiers featured above. Rather than just using water, the OH-6 actually uses water and “Humigel” crystals. The Humigel crystals function similarly to a sponge, but will last roughly a year (possibly longer) before they need to be changed. Currently, a replacement package of Humigel crystals is roughly $8 and contains enough crystals to refill your humidifier up to six times. Oasis humidifiers also collapse (scrunch up) when they dry out, making it easy to see when they’re ready for a refill. The OH-6 also hangs off of the edge of your case. You simply slide a metal strip onto the edge of your case, which affixes your humidifier into one fixed position. If you’re worried that the metal strip won’t fit, Oasis also includes magnets to accomplish a similar purpose. The Oasis OH-6 does require a bit more work initially than a sponge humidifier, but it will be a time saver in the long run. Having a humidifier which attaches to your case, rather than sitting in your strings, is also convenient. Like the OH-6, the Oasis OH-1 uses a special type of gel to humidify your instrument rather than a sponge. However, unlike the OH-6 to OH-1 is designed to sit on top of your instruments strings. Even better, it’s designed to do so without leaking any excess water into your instrument. Oasis humidifiers use a special cloth which is designed to allow the moisture evaporating from the humidifier’s gel pass through while preventing excess water from doing the same. This is especially helpful in humidifiers that sit in the strings over your instruments body, because should they leak they can cause extreme damage to your instrument. If you only play the guitar, this humidifier is a great option. However, if you play several different instruments you may be happier with a humidifier that sits in your case as opposed to one that rests in your instrument’s strings. 87 out of 100. Incorporating 150+ ratings and reviews. 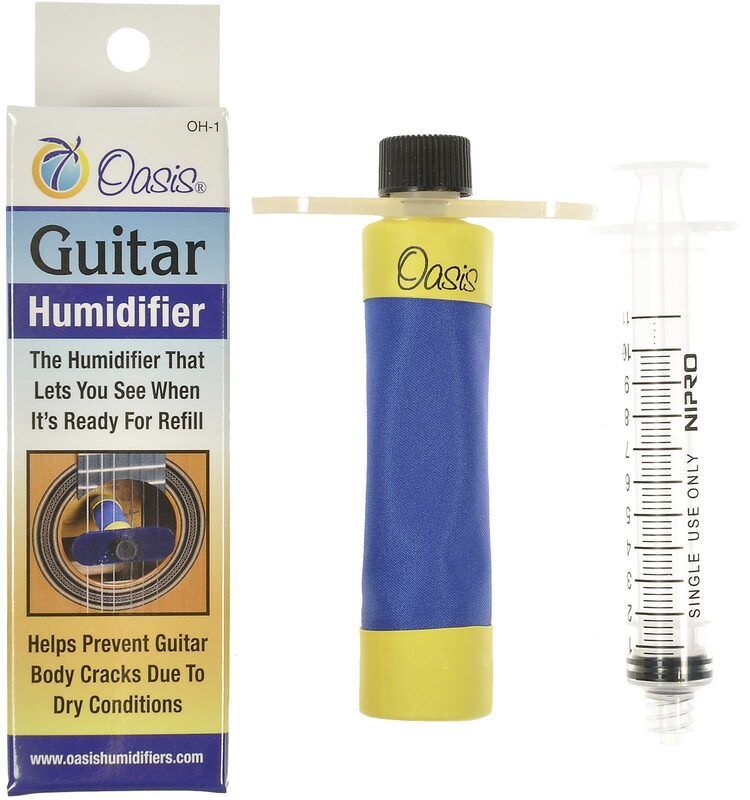 The Oasis OH-5 Plus+ Guitar Humidifier is essentially the same product as the OH-1 above, with one key difference. The OH-5 Plus+ is designed for use in area’s with very dry climates. The fabric used outputs roughly 50% more humidity than the fabric used in Oasis’s other models, which is necessary in incredibly dry climates. Most musicians really aren’t going to need this humidifier, and in areas that are already relatively humid in the winter this humidifier may actually do more harm than good. This is why Oasis only uses this fabric on one model, rather than every model in their line. So, if you live in a desert (this includes high plains deserts, like parts of Wyoming, Colorado, Oregon, and Nevada) this humidifier is definitely worth a look. Another thing to note about this humidifier is that it will also require more regular refilling than other Oasis humidifiers. This is because the OH-5 Plus+ outputs more humidity than the other humidifiers in their line. 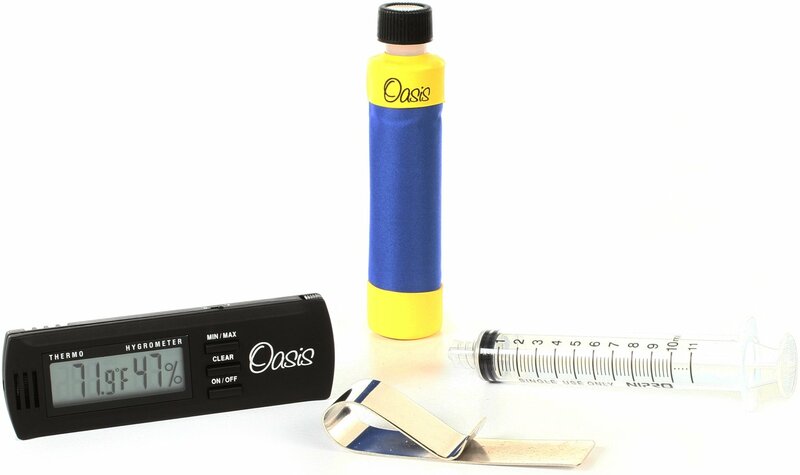 The Oasis OH03 Guitar Hygrometer and Humidifier is a package which includes an Oasis OH-1 humidifier as well as an Oasis OH-2 hygrometer. A hygrometer is a device which measures the ambient humidity in an area, which makes it easier to know whether or not your humidifier is producing the correct amount of humidity for your instrument. The cool thing about the OH-2 hygrometer is that, in addition to displaying the humidity inside of your guitar case, it also shows high and low temperature extremes. The inclusion of the OH-2 makes the OH-3 package a great deal for anyone looking to preserve their instrument, because it has everything that you need in order to protect your instrument from changes in humidity. The OH-1, which has also been covered elsewhere on this list, is a great humidifier in its own right. The gel used in the humidifier has a greater longevity than a sponge, and the casing used helps to prevent leakage. At their simplest, hygrometers provide a measurement of humidity, but most come combined with a thermometer to give you a temperature measurement as well. 81 out of 100. Incorporating 125+ ratings and reviews. 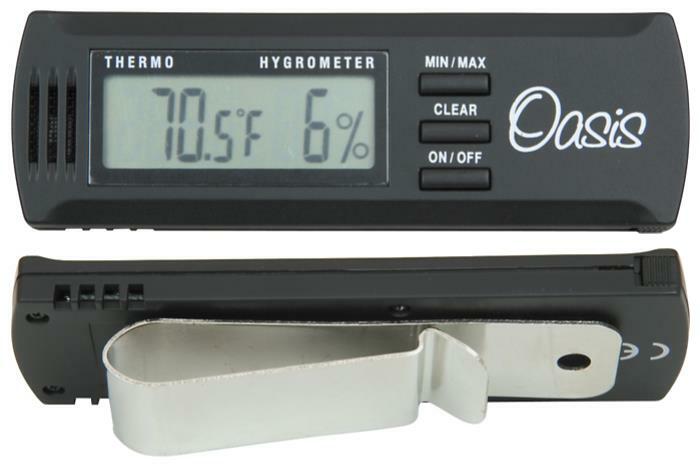 The Oasis OH-2 digital Hygrometer with Clip is an affordable and fully featured hygrometer, making it a great fit for anyone looking to protect their instrument without having to invest in costly and/or difficult to maintain accessories. The Oasis OH-2 Hygrometer functions as both a thermometer as well as a hygrometer. Since both temperature and humidity have an impact on the state of your instrument, a device which displays both measurements inside of your case is incredibly helpful. The unit also displays temperature extremes, letting you know if the area in which you keep your guitar is suitable for your instrument. The OH-2 can also clip onto your case, allowing you to keep it in an area where you can get the most accurate readout possible. The best part about this hygrometer is that it’s actually guaranteed to work for five years following the purchase date, making it a product you can purchase confidently. 83 out of 100. Incorporating 30+ ratings and reviews. 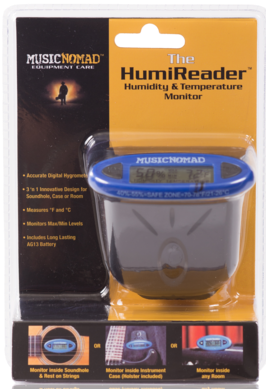 The MusicNomad MN305 HumiReader Hygrometer, Humidity, & Temperature Monitor is a great, no frills in-case thermometer and hygrometer. The main selling point with this hygrometer is that it can actually rest in your guitar strings, giving you an incredibly accurate reading of the humidity your guitar is experiencing. However, while this does help to increase the unit’s accuracy it does mean that you may have to use an incase humidifier as opposed to one that rests on your strings (since that spot will be occupied by the hygrometer). However, you don’t have to rest the hygrometer on your strings. The unit comes with a clip, allowing it to be stored in the case similar to the Oasis OH-2 above. Likewise, you can also leave it sitting out in your room if you happen to have a room humidifier. While this isn’t a must-have feature, the MN305 also comes with a reminder of the proper humidity level and temperature for a guitar. It’s a huge help if you’re not used to having to humidify your instruments, because the unit itself will always remind you what the proper temperature and humidity ranges are for your instrument. If you’re not sure why you need a humidifier, or you just want to brush up on your knowledge before you throw any money down, check out the sections below. The first thing you need to know about your guitar is that, like any other piece of wood, it swells and contracts with changes in temperature and humidity. An excess of humidity causes your guitar to swell (as do hot temperatures) and too little humidity causes it to contract (cold causes the same thing). This can cause cracks in your guitar, potentially destroying your instrument. As a general rule, when it comes to temperature if you wouldn’t want to sleep where your keeping your guitar you probably shouldn’t keep it there. There isn’t a definite temperature range, but your guitar should be kept at a temperature that would be comfortable for you. When it comes to humidity, your guitar should be kept in an environment with somewhere in the neighborhood of 30% to 40%. You can measure the amount of humidity in a room (or your guitar case) with a hygrometer. All solid woods are susceptible to humidity, because they’re a solid piece of wood flexing. If they flex too hard, or too often, cracks occur. While solid wood instruments generally sound better, guitars made with laminate woods are more resistant to humidity because the instrument is made up of layers of wood. Because it’s made up of layers as opposed to being one solid piece, a laminate instrument will flex in situations where a solid wood instrument would break. The best way, by far, to humidify your guitar is to use an in-case humidifier alongside a digital hygrometer. The smaller the area the easier it is to maintain a consistent temperature and humidity. If you leave the door open to your room, or if the heater kicks on in the middle of the night, your guitar can begin the process of drying out. If this happens consistently you can still end up with cracks in your instrument even if you’re using an in-room humidifier. To humidify a guitar in your case, all you have to do is buy an in-case humidifier, supply it with water, and stick it in your case. The only thing you need to be aware of is that, for humidifiers that use a sponge, you want to dampen the humidifier (not flood it). Water can wreak havoc on your instrument, so take care when using a humidifier. We looked through all the Guitar Humidifiers and Guitar Case Hygrometers available from major online American music gear retailers and selected the most promising to put on our short-list for closer examination - you can see many of them in our public music gear database. Next we collected review and rating information about each one on the short-list from customer reviews, forum discussions and similar sources and processed over 3,000 sources with the Gearank Algorithm to provide ratings out of 100 for each of them. Finally, we selected the highest rated options to recommend above. For more information about this process see How Gearank Works.